Infowiz Chandigarh offers CCNP Training Course in Chandigarh, India. CCNP is Professional level certification offered by Cisco Systems, USA. The candidates have better opportunities in IT Networking Domain after completing CCNP Course Training from Infowiz. It helps you acquire the skills and knowledge necessary for executing and maintaining an Enterprise switching & routing network. The Certified Network Professional Routing & Switching (CCNP R&S) course provides Professional level network administrators, network support technicians with the knowledge and skills needed to plan, implement, verify and troubleshoot local and wide-zone enterprise systems, the Cisco CCNP Routing and Switching certification program provides the education and training required to develop hands-on skills and best-practices. After completing CCNP Course Training from Infowiz, the student can go further with CCIE R&S Course Training to enhance their networking skills into Cisco Routing and Switching Domain. We offer Best CCNP Certification Training Course in Chandigarh on Real Cisco Routers and Switches. We also provide CCNP Industrial Training and CCNP Summer Training in Chandigarh on Live Projects with Hands-On Practicals. Training procedure includes not only classroom training but also Hands On training on Cisco equipment. We also give practical workbooks to our students which is a part of our course content. We do not use simulator/emulator software in our CCNP Training. 1. Your daily class at Infowiz will include 2-3 hours of theoretical and practical training which includes in-depth training on CCNP course. After your class, you are taken to our labs where you can practice and learn the actual working of the concepts learned for any number of hours you want to. 2. CCNP course training is given by CCIE R&S (written) or CCIE R&S (lab) certified trainers with 5 to 14 years of industry experience. 3. CCNP lab of NB consists of real Cisco Routers & Switches. Infowiz CCNP R&S Lab is considered as World’s Biggest. You can visit our institute and check our labs, along with a series of routers and switches used. 4. 24×7 availability of CCIE certified lab instructors while you are practicing in labs providing immediate solutions to problems occurring, ensuring uninterrupted high-quality practical training. 5. Availability of Wi-Fi access to enhance your practical learning experience. 6. Remote access to labs and devices within institute premises. 7. World Class CCNP R&S practical workbook to enhance practical knowledge. 8. Doubt sessions ensuring a complete understanding of the course at each and every step. Should know how to implement local area networks. Should know how to implement Internet connectivity. Should know how to manage network device security. Should know how to implement WAN connectivity. Should know how to implement basic IPv6 connectivity. 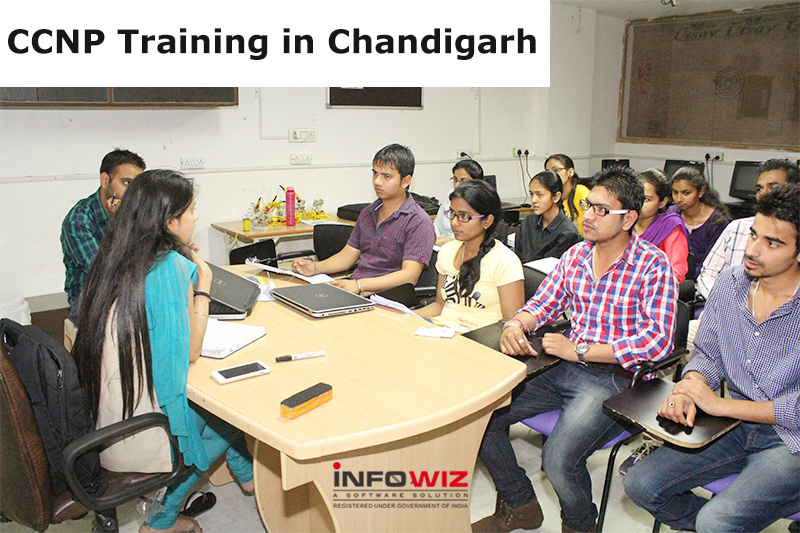 Why Infowiz Software Solutions is known for the Best Institute for CCNP Training in Chandigarh? Certified Expert Trainers with Real Industry Exposure. Live Project training for better industrial exposure. Extra Time Slots (E.T.S.) for Practicals(Unlimited), Absolutely Free. We help our students to take knowledge of complex technical concepts. Multiple Payment options: Cheque, Cash, Credit Card, Debit card, Net Banking.